Used Alfa Romeo 146 Review - 1995-2001 | What Car? What's the used Alfa Romeo 146 hatchback like? This is a classic 'Marmite' car - you either love it or loathe it. 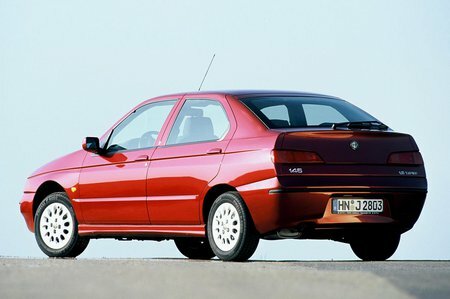 Although the Alfa Romeo 146 is a five-door hatchback, it has been designed to look like a mini-saloon, and as a result, its styling is certainly far less attractive than that of its three-door 145 sister. Inside, it's not too pleasant, either. The cutaway dashboard is blunt, the stalk controls fiddly and the driving position set rather high. Where the 146 does score over the 145 is that it offers more storage space and more room for your rear passengers. As a result, it's far more effective as a small family car. Sadly, like its smaller sister, the 146 has a poor turning circle and a lumpy ride. But, on the plus side, every model in the range has an energetic and raspy Twin Spark 16-valve engine, as well as a positive gearchange.